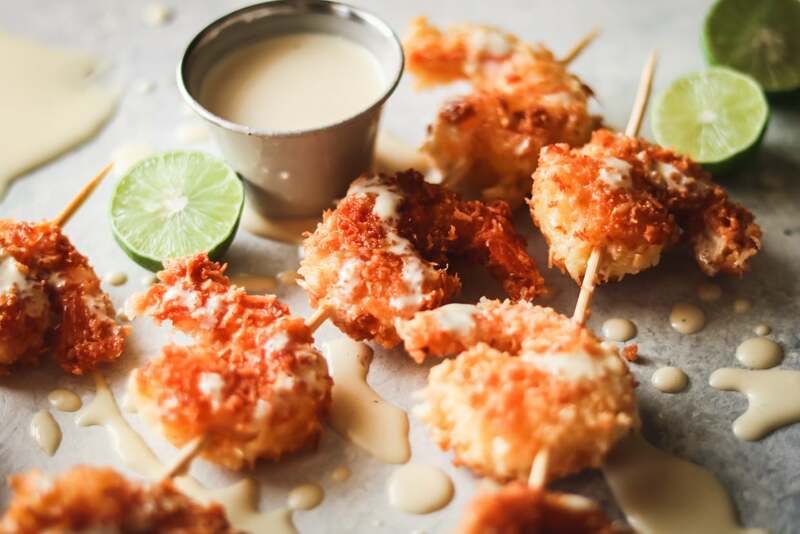 These coconut shrimp with key lime aioli are the perfect appetizer for your next party. This recipe is also both gluten dairy free. Whip up a batch for your next party and dream about sitting beachside. 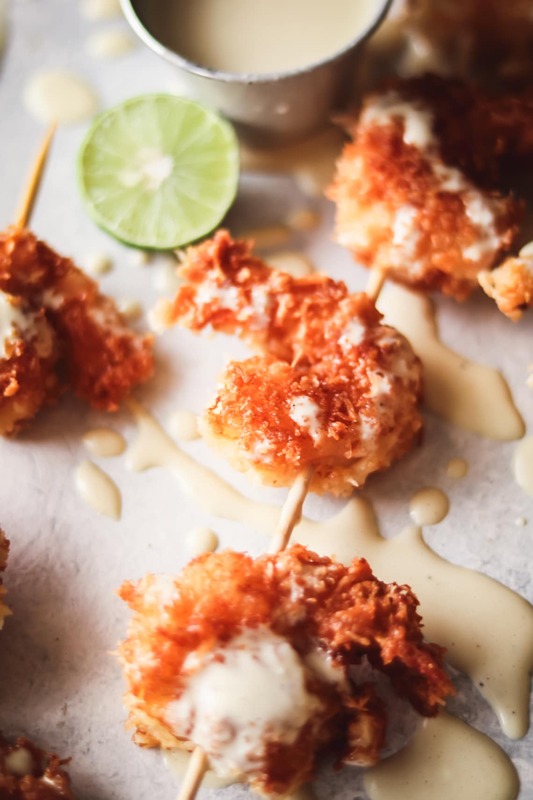 Your guests will love these grab-and-go gluten-free coconut shrimp on a skewer. What can I say, I used to hate coconut, let alone coconut shrimp. But, as I got older my taste buds evolved and I discovered this crunchy, with a hint of sweet, dish known as coconut shrimp. 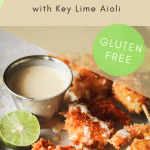 The fun part of this dish is you can simply mix up the flavor combinations by the spices you add to the coconut breading or with the sauce variations. For these coconut shrimp skewers, I chose to pair them with a key lime aioli to give it that true tropical flair. By using a gluten-free flour base and a dairy-free mayo for the aioli you have an easy gluten and dairy free version of this scrumptious appetizer. Adding the shrimp to the skewers makes these the perfect grab-and-go appetizer for your next party. 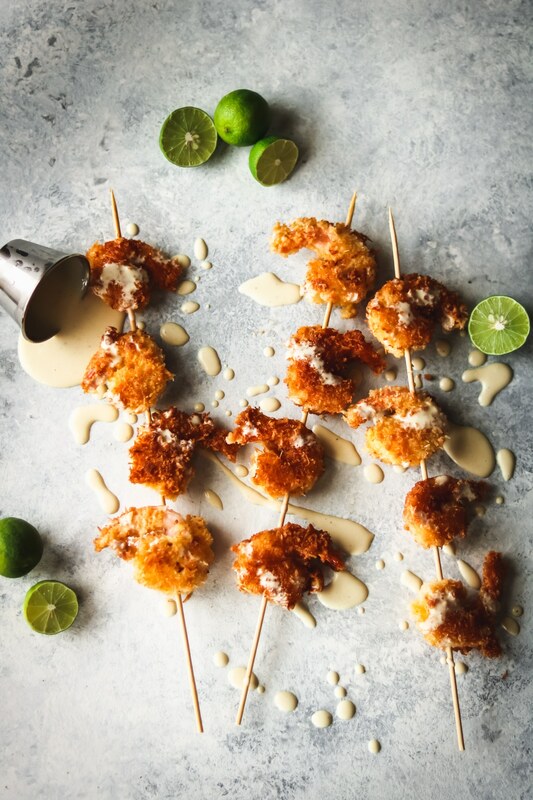 The shredded coconut gave the shrimp a hint of sweet, while the key lime aioli gave them a hint of tart. A match made in heaven! If possible, use a finer shredded coconut. One of the off-putting aspects of coconut is the texture of the longer strands of shredded coconut, so a finer shredded coconut cuts down on this. I like Let’s Do Organic Shredded Coconut because it’s a finer shredded coconut. If dairy-free is not a concern, you can use regular mayo with the aioli. I like the flavor of the coconut oil for frying these gluten-free coconut shrimp, however, use whatever mild cooking oil you prefer. Using a fork, whisk the eggs until blended. Using your hands, blend the coconut and bread crumbs well. First dip the shrimp into the flour, coating well. Then dip into the egg, then thoroughly coat in the coconut and bread crumb mixture. Place shrimp into heated coconut oil. As the shrimp are cooking, combine the aioli ingredients in a small bowl and store in the refrigerator until ready to serve. Once finished, remove the shrimp and place onto a paper towel lined plate while you finish cooking the remaining shrimp. 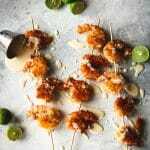 If you like these gluten-free coconut shrimp skewers, then you might also like these gluten-free appetizers.